It is almost impossible to say exactly when the production of silk began. Recent Chinese archaeological finds have uncovered carved ivory depictions of silk worms thought to be 6000 to 7000 years old. According to legend, the Chinese princess Hsi Ling Shi claims the honour of discovering silk. Apparently she dropped a silk cocoon into her cup of tea, and when she removed it, the silk had unravelled into a single strand. It was from this one accident that the production of silk is supposed to have been born. The Chinese carefully guarded the secrets of silk production (sericulture) for thousands of years. It was a capital offence to attempt to smuggle silk or reveal the secrets of its production outside of China. At one stage, silk was so highly regarded that silk clothes were the privilege of the Emperor alone. Silk had a major impact on Chinese foreign trade, and helped keep the Chinese dynasty afloat through thousands of years. As time wore on and the secrets of silk manufacture were passed from generation to generation, production methods improved and silk became a more widespread commodity in China. It is recorded that the secrets of sericulture had reached Korea by 200 BC and 100 years later silk was being produced in India. The late 1st and early 2nd Century BC saw the opening of the silk road, a route which stretched over 4000 miles through Asia and on to the Middle East. Silk was traded along this route and eventually found its way into Europe as a highly prized commodity, often considered to be more valuable than gold. It is recorded that Roman emperor Heliogabalus was the only Roman of his time to wear a garment made of pure silk. Marco Polo (1254-1324) was possibly the routes most famous traveller. 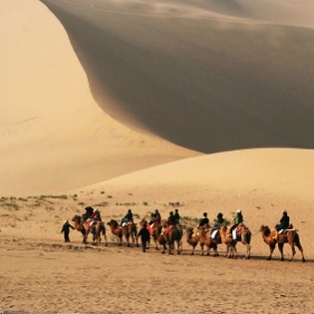 He travelled through Mongolia and into China, finding the source of the silk road. It was after his return to Venice that European silk production began. Throughout the ages silk has been a valued commodity and today is no different. Although the volume has increased, the fundamentals of silk production have stayed largely the same. The natural properties of silk and its hypoallergenic qualities have been well documented and are becoming increasingly popular. Here at silksleep we are proud to uphold the ancient tradition of the silk road, bringing the finest quality silk products we can find to our customers.